Ronnie and Sarah at Centre for Trials Research on Do Different Day with Mark Goddard. The Centre for Trials Research participated in the School of Medicine’s ‘Do Something Different Day’ inviting colleagues to try something different by joining our Data Managers, our Archivist and/or Development Officer and to experience a part of their role. 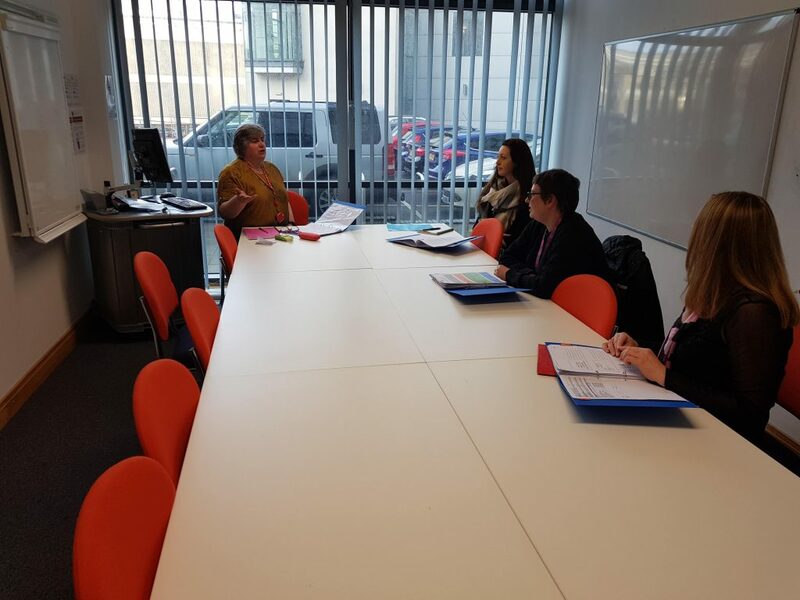 The Scheme was introduced by the School of Medicine to give individuals the opportunity to visit a different department for a day, to broaden their knowledge and gain an insight into the ‘bigger picture’ e.g. the wider workings of the School. The benefits include an opportunity for career development, improving communications, networking and gaining a greater understanding of what happens in other Departments and Divisions. Participants were encouraged to consider a placement in a different Division and possibly even following a different career pathway. The CTR Learning & Development Group and Director Professor Monica Busse, Director of Mind, Brain and Neuroscience, were very keen to participate in the scheme this year. We wanted to take advantage of being able to network with colleagues across the School of Medicine, to provide an insight into the important and interesting work undertaken by the Centre, how we manage the research process ensuring we work to numerous regulations and how we ensure our work is to the highest standard. We agreed that we wanted to take advantage of this opportunity giving colleagues a chance to consider if this would be something that may interest them in the future and to help promote a greater understanding of the work we undertake. We offered three placements and had six colleagues who were interested in joining us, which we were very happy to accommodate. Coloyns Blake welcomes colleagues to the Centre for Trials Research. 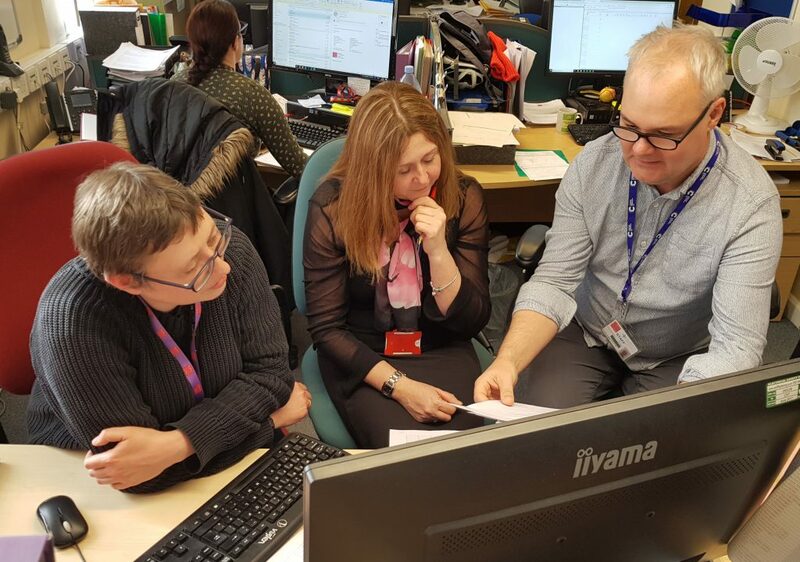 We undertook the Do Something Different Day over 13th and 14th February so we could give our colleagues the time and support they would need to get the most for this learning experience. We provided folders with information about the day, the structure, mission and values of the Centre as well as providing standard operating procedures and policy documents relevant to their individual experience. Nigel Kirby (head of data management) and Carolyn Blake (head of the administration team) gave presentations during the morning in preparation for the hands-on experience in the afternoon. 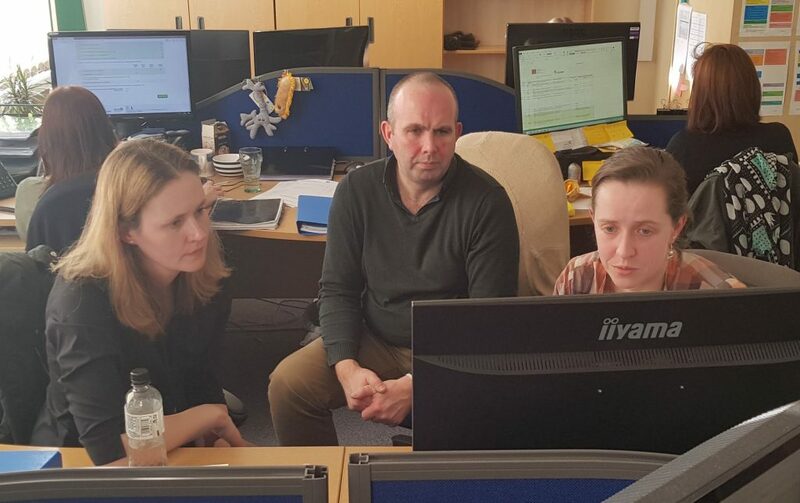 On Wednesday we were joined by Ronnie, Sarah who were with us for the Data Management – Database testing and verification experience and Kate who wanted to gain insight into Study/Trial archiving. On Thursday we were joined by Stuart and Wendy for the data management experience and Iris for the development officer experience. We really enjoyed meeting Ronnie, Sarah, Kate, Stuart, Wendy and Iris; talking to them about where they currently worked, their skills and their interest in research, and hope to be able to further build working relationships as a result of this experience. Participants reported they experienced “a very enjoyable day, both informative and hands on”. I have been a member of staff at Cardiff University for 2.5 years. I cover most of the lifecycle of a project, mainly after the data gathering has occurred in my role. Although I am involved in the build and collection of the data as well more recently. For me, the most interesting part of Do Something Different Day was the testing of the data gathering, as the projects I work across are relatively small. To see testing on a larger scale was very interesting. I was surprised as to the volume of projects and data gathering which is being carried out. I had no idea it was as large as it is. In all a very very informative day very well put together and thought through. Ronnie and Sarah on Do Something Different Day working alongside Mark Goddard. I’ve been at the university in various roles for 5 years. How did this compare to your usual role? There is much more data and it’s handled very differently. The organisational structure seemed really clear. What was most interesting about the day? Learning about the research process, from the idea to publication. The lack of special computer skills required. The idea that I could use the skills I already have to do something different. Well written SOPs [standard operating procedures] can be really helpful and Publisher looks like a lot of fun. Anything else that stood out for you. I have been at Cardiff University since September 2014. I worked as Research Coordinator and now project manager on clinical non-CTIMP trials. The CTR trial manager role is more specialised, as CTR has data management and quality assurance, which I have to handle in my current role myself. However, the roles are still comparable. The size/number of employees surprised me the most. I took away several things from the day including motivation, job description and new contacts! I joined Cardiff University as a postdoctoral researcher in July 2011 and since then, my research has focused on type 1 diabetes. Since 2015, I’ve worked part-time in a job share. There are some similarities between the data management role and my current role, in terms of handling and inputting data into spread sheets as well as learning to use new software appropriate to the job. 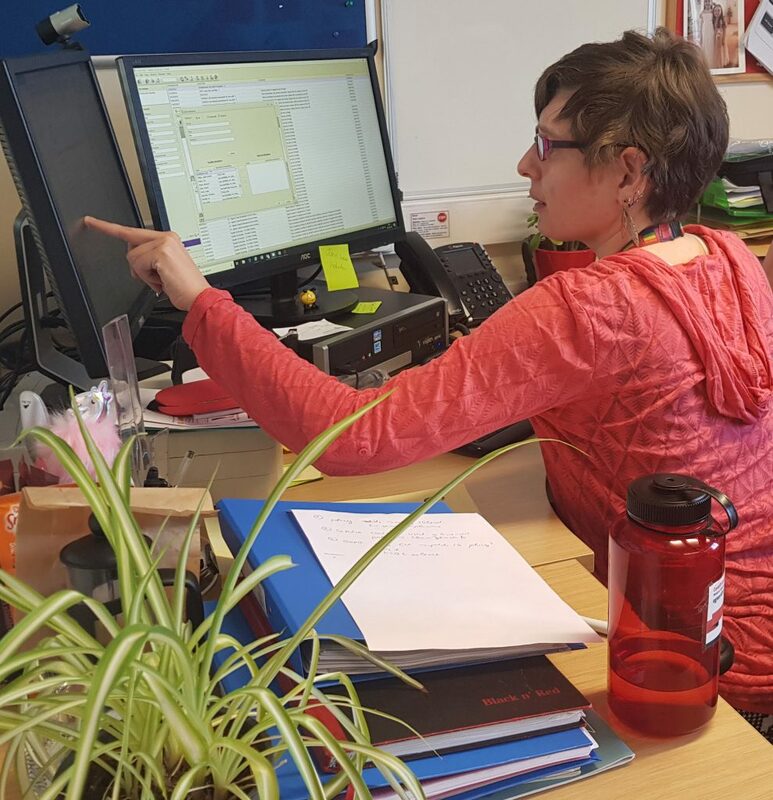 I’m GCP-trained, I write risk assessments and protocols, design experiments, recruit healthy volunteers to my study, analyse and present data – not too dissimilar to the data management role. I guess the main difference is that I receive and process patient blood samples and perform experiments on white blood cells. I always ensure my work is of a high-quality standard but there’s no QC and QA here! Although I test patient lymphocytes in the assays I design, I’m not directly involved in clinical trials but I work alongside colleagues that are and I do hear about the Centre for Trials Research every now and then. I was curious to know more about the CTR and whether it could be a viable option for a career change which is why I decided to take part in the Do Something Different Day. It was a very good experience; well-planned with interesting and useful presentations from both Carolyn and Nigel. It was also useful to work shadow one of the data managers to find out more about her day-to-day role. The whole day was relaxed and everyone seemed friendly. I was pleasantly surprised to find out that research interests are encouraged along with writing/publishing papers and grant writing (although I think that the latter two are more a Trial Manager’s role rather than a data manager role). I felt very positive about the experience and will definitely consider applying for a position to join the CTR in the future.